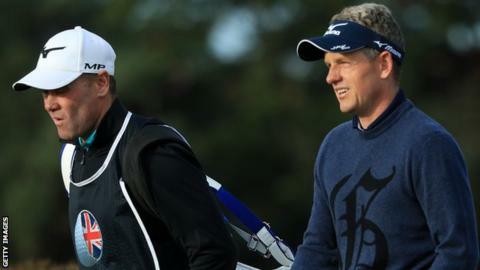 Luke Donald says being a Ryder Cup vice-captain was “inspiring” as he returns from a lengthy injury lay-off. Donald said helping Thomas Bjorn’s team to victory made him realise how much he had missed the game while he was unable to play because of a back problem. “It was a great team atmosphere – our team came together as one,” he said. Donald, 40, has since played in his first tournaments since April – missing the cut at both the Alfred Dunhill Links Championship and British Masters. The Englishman was one stroke away from playing all four rounds in Scotland, before rounds of 78 and 73 meant he made an early exit at a windswept Walton Heath. “I see two missed cuts and, as a competitor, you are kind of annoyed at that and feel like you want to do better,” former world number one Donald told this week’s edition of The Cut, the BBC’s golf podcast. “But these weeks weren’t really about chasing victories, it was more about getting competitive rounds under my belt and seeing how my back dealt with some cold weather and some difficult conditions. “In terms of that, it was pretty positive. A lot of my long game was pretty decent – what I’ve really struggled with is around the greens. But it was a huge positive for a golfer who has played on four winning Ryder Cup teams. “It was inspiring,” he said. “It made me realise how much I did miss being away from the game over the last four or five months. Donald knows it is a long way back. A ranking of 430th is a far cry from 2011, when was world number one and led the money lists on both sides of the Atlantic. The Florida-based Englishman is now weighing up when to return to the PGA Tour. He is considering whether to enter any of the fall series of events, or to work more on his game before starting up again in the new year. Either way, he is pleased to have his clubs back in his hands. “It is a relief because even coming into these two weeks it wasn’t 100%,” he admitted. “I could still feel it now and again a little bit. I have to do a lot of work on it. But to get through these two weeks and feel pretty good and pretty much pain-free is very encouraging. “I think I’m on the way back to being able to put in lots of work on the range and get back to where I need to be. So a significant hurdle has now been cleared, giving him cause for confidence for the future. “I always felt like there would be more for me on the golf course and I still feel that way,” he said. “I think I have a consistent enough game and someone who has a pretty good short game and putting is going to have some longevity in this game. “Obviously I need to find that back again because it kind of disappeared the last two weeks but I’m not too concerned.